It is only on a rare occasion that a true masterpiece of a film comes along. 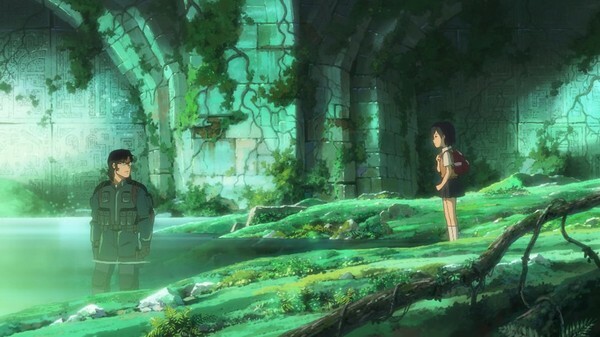 Makoto Shinkai’s anime epic Children Who Chase Lost Voices is one of those rare gems. After we reviewed the film at last year’s REEL Anime festival, I was left with one question – How do you top this? After watching this film for a second time now, I am still at loss as to the answer to that question. This is an incredible film in all regards, a truly thoughtful tale spun with purpose and heart. Children Who Chase Lost Voices is the height of more than a decade of work and it honestly feels like Shinkai’s magnum opus. The journey that Shinkai takes us on with Children Who Chase Lost Voices is unforgettable, touching, heart-breaking, honest, captivating and beautiful in ways that words just can’t describe. Once you say ‘Hello’ to this film, you’ll never want to say ‘Goodbye’. Children Who Chase Lost Voices is both perfectly simple and deeply complex. It is easy to write this film off as a fluffy family adventure, but it is so much more than that. There is a heart and soul underneath all of this film’s layers, honest and pure, raw and chaotic, blissful and raging, lost and found, pained yet hopeful. This is not your average film, this is life in motion. Shinkai’s genius is evident throughout this film. He just sees something that very few can, something so intangible yet so very real. Many of his films focus on separation and distance but none are as introspective and thoughtful as Children Who Chase Lost Voices. On the surface this film is about a journey deep beneath the earth, but it is so much more than that, this is about a journey deep into ourselves. Throughout the course of the film, Asuna and her companions learn that nothing is permanent, life burns out and hello turns into goodbye. Dealing with this separation, this painful truth, is what Children Who Chase Lost Voices is all about. There is a poignancy to this film that very few can ever grasp. To accept life is to accept death, all things begin and all things end, ever hello always ends in a goodbye. How we find the strength deal with these things is what makes us human. All three of the film’s protagonists take a very spiritual journey, each compelling and moving in their own way. Each character has a reason to adventure into Agartha, what they find deep below may not be what they expected but ultimately they discover that sometimes you have to say goodbye, no matter how painful that may be. Shinkai has crafted a truly affecting film that tells a story that anyone can relate to. We all know the feeling of loss, that hope to return to the way things once were. Shinkai captures that to perfection in a film that can be enjoyed by everyone. This isn’t your ordinary anime film, this is something special, a genuinely life-changing experience. This is the magic of film. Once again Makoto Shinkai has made one of the most aesthetically beautiful anime films of our generation. With each of his film’s his artistic styling improves and becomes more refined. Children Who Chase Lost Voices is the summation of that growth. The sprawling landscapes of Agartha and even those of Earth are vividly detailed and awe-inspiring. Shinkai really solidifies himself as not only a superb story-teller but also an excellent artist. 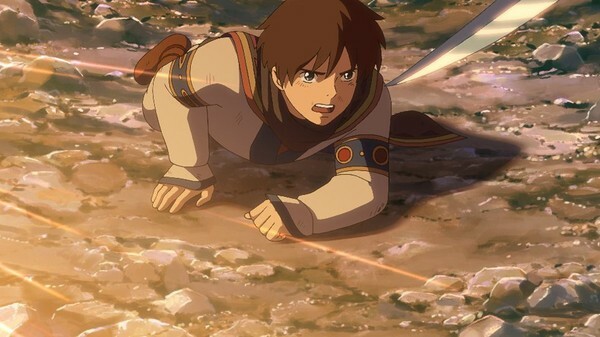 He has really polished his craft, seemingly taken a few steps from Studio Ghibli in character design, but all the while retains his unique style that we have come to know from his works and then builds upon it. I must say, this film is truly done justice on Blu-Ray. The full level of beauty is crisp and sharply conveyed on this platform and I honestly cannot imagine it looking any better. The Blu-Ray version’s visual experience alone is worth the price of admission. 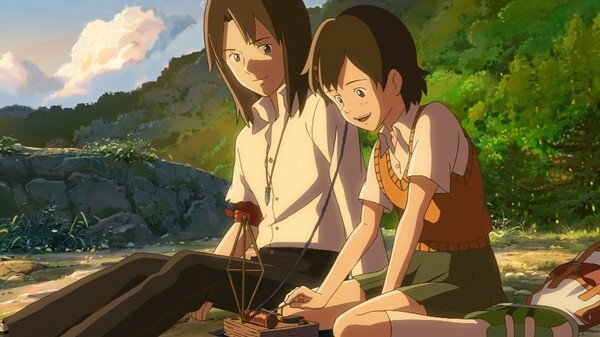 Children Who Chase Lost Voices is also blessed with a remarkable soundtrack, exquisitely composed by Tenmon, a long time collaborator with Shinkai, having previously worked on all of his film’s musical composition. The film also has a lovely and very fitting theme song titled ‘Hello, Goodbye and Hello’ performed by Anri Kumaki. 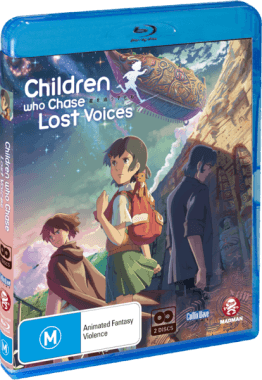 This particular release of Children Who Chase Lost Voices also happens to feature a brilliant English dub along with it’s original Japanese audio. The English dub features a truly stand-out performance from Hilary Haag as Asuna. Interestingly enough Haag previously played to role of Akari Shinohara in the English dub of Shinkai’s 5 Centimetres Per Second film. Madman Entertainment’s release of Children Who Chase Lost Voices is an impressive one to say the very least coming bundled with a plethora of special features of which an entire disc is dedicated to. Not only do you get the incredible film but you also get a Making Of featurette, interviews with the cast and Makoto Shinkai himself, trailers, promos and a very special look at the works of Makoto Shinkai. Despite this astonishing amount of content, the release is not without its oddities though. I found it very curious that Madman has once again used the Kaze/Manga UK Blu-Ray release, this is very evident due to a major inconsistency on this Blu-Ray. When you load up the first disc the film is referred to by UK name Journey to Agartha, this is an odd inconsistency to say the least. The other oddity was the fact that the special features disc was not in fact a Blu-Ray but actually a DVD. While both of these things are strange, this product is overall truly excellent and without a shadow of a doubt deserves a place in any anime fans collection. Children Who Chase Lost Voices speaks to me. No matter how many times I see this film, it still moves me with its sway. If I could hazard a guess at what this film was made of I’d say heart, soul and some kind of magic. Makoto Shinkai is a very remarkable man whose genius may not be as appreciated as it should be. 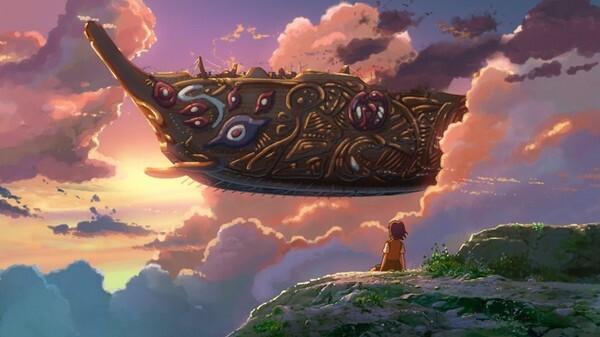 Many call him the ‘New Miyazaki’ but that he isn’t. 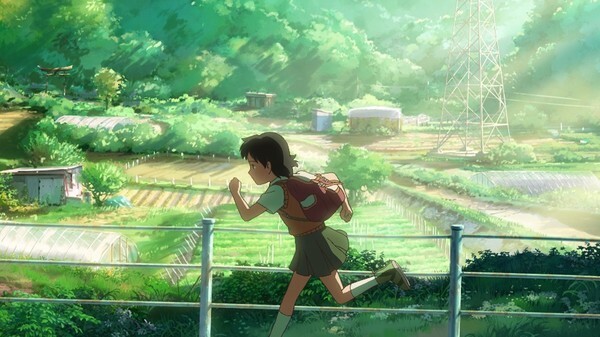 He is the first Makoto Shinkai and this film is his masterpiece. This is an experience that I’ll always cherish and it is one that I’ll return to again and again. Having seen this film a number of times now and I know one thing for certain. No matter how many times I say ‘Goodbye’, there is always another ‘Hello’ on the horizon. So for now, I’ll see you again, somewhere deep below.